I am beyond excited to kick off my Christmas Gift Guide series, I often read these type of things on Bloglovin' and also on Pinterest and I just think they're such a great idea. I decided to split it into categories - Beauty, For Mum's, For him, For her & Stockings. I love this time of year everyone is starting to get prepped and organised for Christmas and I love getting ideas from other people of what to buy for your loved ones. I thought I would start off this series with Beauty as it's definitely a popular thing for women/girls to ask for over Christmas. Charlotte Tilbury Instant Eye Palette - This eye palette is SO beautiful and I just think it would make a perfect gift for the makeup loving gal's out there. I actually would love this palette my self as they are pretty much all of the colours I wear! Charlotte Tilbury is definitely a luxurious makeup brand so I think any makeup lover would be over the moon to open this on Christmas Day. 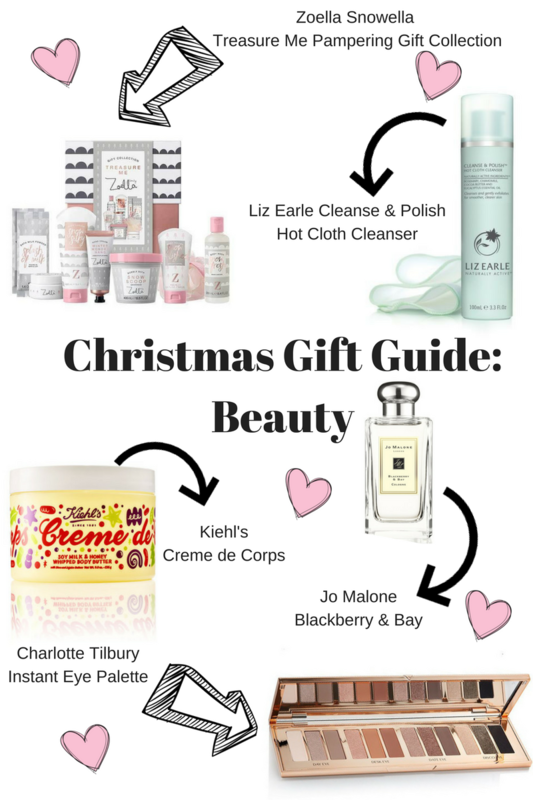 Jo Malone Blackberry & Bay - Because who doesn't love a beaut new fragrance on Christmas. This is definitely one of Jo Malone's bestselling fragrances and the scent is just beautiful. I think any Jo Malone products make great gifts and if you buy it from the store they gift wrap it beautifully! Kiehl's Creme de Corps - Another bestselling product which would be great as a gift as it comes in stunning Christmas packaging. I know when I attended the Christmas Kiehl's Event in Newcastle last week they had the limited edition Mickey Mouse Creme de Corps packaging so if you have any Disney lovers too this would be a great gift. Liz Earle Cleanse & Polish Hot Cloth Cleanser - I have actually grabbed this as a gift for Christmas a couple of times over the last few years and it always seems to go down so well. It's definitely a very popular product and who doesn't need cleanser, they actually have this in some beautiful Christmas packaging too which is great as it just makes it look even better! I personally love this cleanser myself so that's why I added it into the gift guide as I know it's a winner in my books. Zoella Snowella Treasure Me Pampering Gift Collection - Now this, this was just the best thing I found to add into this gift guide. Not only is it amazing but also great value for money. Now we will all admit how popular Zoella is for one, I personally love her but not only that but her products are actually great too. This whole pampering box is filled with some of her Christmas collection and is only £30 at the moment from Superdrug - amazing!